As the year is drawing to an end, so is the second Oppo Endurance Championship. We’ve had a lot of great racing and a bit more still yet to come, but now it is time to start planning for next year. I’ve compiled a few working ideas I’ve had as a baseline to judge your interest and see what you all want to race. However, there are plenty of other ideas on Robo’s series idea sheet. One thing that will remain constant throughout all of these is a monthly format, as that is the easiest for me to organize and has seemingly worked well for retaining interest in events. It is also worth noting that regardless of what series is chosen, the Oppo Daytona and Le Mans 2.4s will still happen, either as a part of a championship as it is now or as one off events. Alongside the OEC that is currently running, this is a series that I have always wanted to run. And in Forza 7 now we have an all time high number of these cars available. If this series were run, it would become OEC III. RORA raced these cars back in 2017, though with a more limited car list. It was a lot of fun, and I have no doubt revisiting it would be equally fun. BoP would be a worry though, what with the Eagle Mk. III and the 935. Handicaps would be needed for the first time in one of my series, which I’m not super fond of. Though thankfully SVTyler has already been working on builds and there is already a sort of baseline for the cars already in place. This is a bit of a more unique idea I came up with while doing BoP for Road Atlanta of all things. 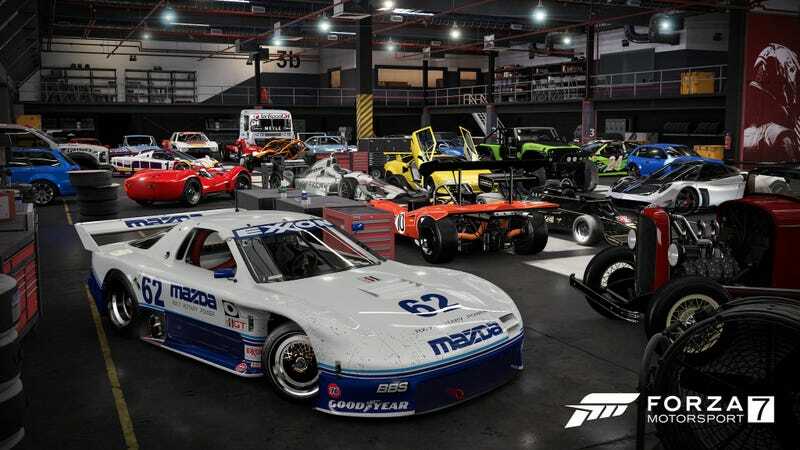 Basically, any cars (excluding hypercars) from the 1980s, 1990s, and very early 2000s are eligible and built to one of the classes listed above. It has the potential to bring out some real variety in what people think makes the best race car. Biggest problem though would be trying to figure out how to balance everything. My current form of BoP would probably need to go and a system similar to RRIPA would need to be used. In addition, this could be adapted to use modern cars instead, basically creating an SCCA amateur GT class. Last time OEC ended, we did Formula 1, and it was awesome. From an organization stand point, this was my favorite series. There was no BoP, it was easy to run, and the racing was great. I prefer endurance racing, but Formula 1 is definitely fun to race. If we do go this route, the real question is which years of cars do we use. The faster modern cars would be awesome but they are very hard to drive fast and the skill gap would be accentuated greatly. Older cars would be awesome as well, though they’d be actively trying to murder us, which is great. Another route to go is a revival of a past series. While all of these have already been run on Oppo, we have new cars now that could add to the series. Not to mention that a lot of the current crew of people racing didn’t get to experience these series. I for one would like to do OEC I again, I mean who doesn’t love a Corvette DP racing a 919 and an R15 while weaving though a class of combined GTE and GT3 cars averaging 700 hp (also shoutout to the SRO for stealing my GT class and calling it GT2). We finally got the 917/30 so Can Am would be fun to do again, though the cars are still evil. As said above, 1970s F1 was great, and we have another car now too. The only one I’d be reluctant to run is Trans Am, since basically every car that raced that has made an appearance in OEC this year. So while there are a quite a few things I’d be willing to run, there are also a few things I’m not. I listed them and the reasons above. Now I should say I am actually interested in everything above, but they’re either not practical or need more time. Like I’d love to do 1960s NASCAR, but I’ve actually tried to build those cars and BoP for ovals is impossible, and yes I do mean impossible. As for things like rallying, Forza 7 is not the game for those cars. Maybe it would work in Forza Horizon 4, but for the time being I’m not ready to look into that game yet, though our friends at RORA might have other plans. And while I’d like to ditch the shitshow that is Forza 7, unfortunately I don’t think we have enough of a consistent player base on other games, at least not yet. So these are the current working plans as they stand now. More may be added, some may be ditched. Let me know your ideas in the comments and on Discord.